The 1”-type 20-Mpix MOS BSI-type sensor and Venus Engine processor offer a maximum ISO 12,800 and deliver stills at a rate of up to 10 fps (dropping to 6 fps with AF). The sensor also offers 4K (3840×2160) video at 30p and 24p, and includes hybrid 5-axis digital and optical stabilization, albeit for 4K video only (the camera uses the in-lens stabilization for stills). The sensor and lens are also responsible for the camera’s fast autofocus. The LX10 uses Panasonic’s DFD (Depth from Defocus) technology which compares fewer contrast measurements and accesses data about the lens’ specific defocus (bokeh) characteristics, resulting in rapid acquisition and ultimately faster focusing than conventional contrast-detect systems. The LX10 can also shoot 120fps slo-mo video and has a range of 4K video options, including a “Post Focus” feature that you use to select the in-focus area after shooting, and a focus-stacking function to increase the apparent depth of field by combining multiple frames from its focusing range during a clip. 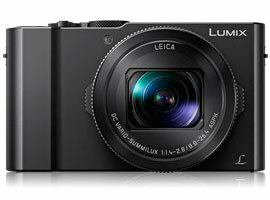 The LX10 is available now at around $699. The Panasonic Lumix DMC-LX10 delivers excellent all-round image quality, boasting scores that are among the best in class for this sensor size, and rivaling those from the earlier Panasonic Lumix DMC-ZS100, which uses a related sensor. The sensor’s dynamic range is excellent at base ISO, measuring a wide 12.5 EV at ISO 80, and although it drops or narrows quickly at higher ISOs, it’s still around 10.5 EV at the manufacturer’s ISO 800 setting. This makes it well-suited to general landscape, interior, and architecture photography, where you may need to manipulate the exposure to handle tricky backlighting. The Panasonic Lumix DMC-LX10 is capable of excellent color discrimination at base (just under 23 bits) and continues to impress up to ISO 400, where it maintains in excess of 20 bits — enough to ensure good rendition of skin tones in low light. As for low-light ISO performance, the 1” BSI sensor achieves good signal-to-noise ratios (SNR 18%) of 37.8 dB at base, with good results still possible at up to ISO 800 (nudging the 32 dB range). With the same (or at least related) 20.1Mpix 1”-type BSI MOS sensor as the earlier Panasonic Lumx DMC-ZS100, the new LX10 achieves an almost identical performance in the lab, and essentially the same image quality. While we don’t know the source (albeit most likely Sony), it’s a class-leading performer for a 1”-type. 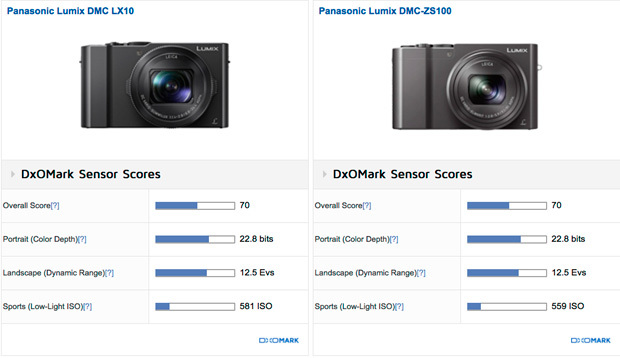 Comparing the Panasonic Lumix DMC LX10’s image quality results with those of two rival compacts using the same size sensor, we can see that its scores are practically identical with Sony Cyber-shot DSC RX100 IV, and ahead of the Canon PowerShot G9 X Mark II. All three camera sensors share similar noise characteristics not just at base ISO (with a slight advantage to the Panasonic due to a lower measured base than the other two), but throughout the ISO range up to at least ISO 3200 (at which the Sony uses smoothing to lower noise at around the 24 dB mark). The smaller sensor has its limitations, with noise levels at an acceptable 30 dB up to around ISO 800 (manufacturer’s settings) for all three models, though in reality this is more like ISO 600 in the lab. The three compacts also share similar dynamic range characteristics. The results are practically identical from base to ISO 800 (manufacturer’s settings), where the Sony shows a modest improvement of up to +0.6EV from ISO 6400 (manufacturer’s settings). Even then, it’s unlikely to have any bearing on outcome and is due to some kind of fancy smoothing algorithm rather than any difference in sensor design. Both the Panasonic Lumix DMC LX10 and the Sony Cyber-shot DSC RX100 IV continue to plot practically identical performances for color depth throughout the sensitivity range, supporting the notion that the two share similar sensors. The Canon PowerShot G9 X Mark II, on the other hand, has noticeably lower color performance, not just at base but through to ISO 800, after which it matches both the Panasonic and the Sony. Although the two cameras target different markets, it’s no great surprise to see the Panasonic Lumix DMC-LX10 adopting the same sensor as the earlier Lumix DMC-ZS100 and that this results in the two achieving practically identical performances. With excellent scores in all categories for this 1”-type category, the 20.1 Mpix BSI- MOS sensor is the class-leading sensor (at least for the time being). For general photography, the LX10 offers great results up to ISO 800 and its small size and mix of still and video capabilities make it a highly desirable choice. Its lack of a viewfinder may limit its appeal slightly, however, and you can get better overall image quality, particularly low-light performance by stepping up to mirrorless Four-Thirds or APS-C models. But if you’re looking for camera to take with you everywhere, then the excellent still performance and the 4K video option might just swing it for you.